General elections at world’s biggest democracy have started; which is also world’s second most expensive elections after USA with total spending of Rs 30,500 and counting. More than 150 million first time voters are going to exercise their voting rights and elect their representatives who will govern them and rule them. There are total of 814 million registered voters who would be using 1.8 million electronic voting machines all over the country. As per World Bank’s 2010 research, one third of world’s poor reside in India. 68.7% of Indians earn less than $2 per day while 32.7% Indian fall below the International Poverty Line of $1.25 per day. For several of such Indians, their vote is their only shield against the hardships of life. Their one vote can make or break their survival for the next 5 years. Compared to affluent upper class and comfortable middle class, it is this segment of our population which are more dependent of elections and their choice of political party. Here, we share the top 10 richest contestants who are fighting it out this general election. With declared assets worth Rs 7710 crore, Nandan Nilekani is the richest Indian who is going to fight the 16th Lok Sabha elections. He was the co-founder of Infosys, the 3rd biggest Indian IT company and was Chairman of Unique Identification Authority of India (UIDAI). He has now joined Congress and contesting from Bangalore South. With declared assets worth Rs Rs 3,08,31,54,000 ( 308 Crore+), Naveen Jindal is the second richest contestant. He is a sitting MP from Kurukshetra Lok Sabha constituency in Haryana. You can send him an email at [email protected] or call him at: 9896344354 for more information about his wealth and his plans if he wins this time. He has two criminal cases pending against him as of now. With declared assets of Rs 3,06,75,35,137 (306 Crore+), Moni Kumar Subba from Tezpur, Assam is the third richest contestant. He is part of Congress party but fighting it independently this time. Two criminal cases are pending against him, including one which alleges that he is not an Indian. He has studied only till class 8th. You can contact him at 09933300111, 09560809740. Malook Nagar is contesting this elections from Bijnor, UP with BSP ticket. He has declared assets worth Rs 2,89,62,00,000 (289 Crore+) and he is ranked #4 in this list. You can email him at [email protected] or call him at 08800347000 for more information. With declared assets worth Rs 2,06,90,80,434 (206 Crore+), Kamal Nath from Congress is ranked #5 in this list. He is contesting elections from Chhindwara, MP. With assets worth Rs 1,98,99,84,945 (198 Crore+), M. Shahid from BSP is ranked #5 in this list. He is contesting from Meerut and has only studied till class 6th. His contact details: [email protected], Contact Number: 09837070786, 0121-2423122. He has declared assets worth Rs 1,95,96,85,779 (195 Crore+) and is ranked #7. He is contesting elections from Bhandara-Gondiya seat in Maharashtra. You can email him at [email protected] or call him at 07182-252727 for more information. Denis is fighting this elections from Shillong, Meghalaya. With declared assets worth Rs 1,28,70,25,457 (128 Crore+), he is ranked at #8. Kapil Sibal is a veteran Congress leader and Union Minister in the present Government. He is fighting this election from Chandni Chowk, Delhi. He has declared total assets worth Rs 1,14,47,47,216 (114 Crore+) which makes him 9th richest candidate. With total declared assets worth Rs 1,08,31,15,000 (108 Crore+), Shruti is the 10th richest candidate for this year’s election. She is fighting from Bhiwani-Mahendragarh constituency in Haryana. Her contact details: [email protected]; Contact Number: 01664254832, 01123795190, 9416025250. She is an advocate. With total assets worth Rs 78,65,95,116 (78 Crore+), Kuldeep is ranked #11 in this list of richest candidates. He is fighting this election from Hisar, Haryana. He has one criminal investigation pending against him. His contact details: [email protected] ; Contact Number: 01662-244595. At number 12 is Ashwini Kumar from BJP, who has 6 criminal cases pending right now. He has declared total assets worth Rs 69 crore. Not surprisingly, 5 out of 10 richest candidates are from the present governing party: Congress! Giving good competition to Congress in this list are 2 candidates from Bahujan Samaj Party which is spearheaded by Mayawati. 2 are independent (with one of them having roots in Congress), one from NCP and one from little known Haryana Janhit Party. 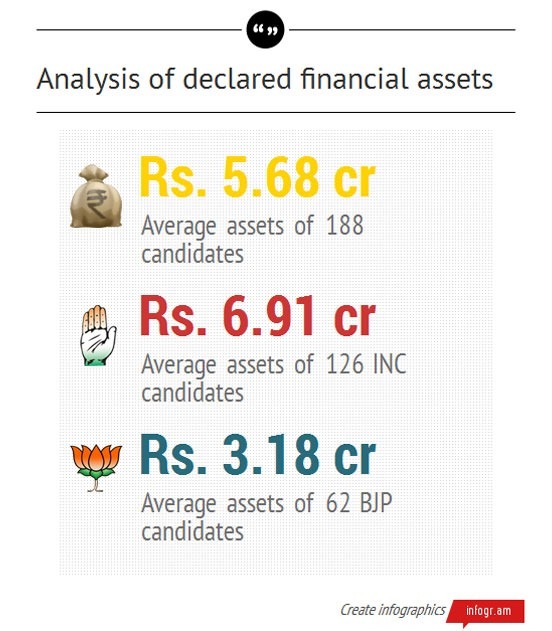 Here is an interesting infographic comparing average assets of candidates from two largest parties: The BJP and Congress. The candidates from Congress have is more than double the average assets. Over to you, fellow Indian citizen. Do cast your vote and bring the change. Noticed one thing there is no one from BJP.. Less corrupt? NEW DELHI: The Aadhaar number repository and its IT infrastructure will be run by HCL Infosystems, which has beaten TCS to win a 2,200-crore contract from the Unique ID Authority of India. According to government sources, TCS bid about 6,500 crore for the contract while Mahindra Satyam backed out from bidding in the final round. The bids were opened late afternoon on Thursday, at just an hour’s notice to vendors. Holy cow! Rs 3,08,31,54,000 o_O. Kon kehta hai ki bharat gareeb hai???? How could you miss Mr. Nandan Nilekani. His total assets are worth Rs. 7700 crores.